Student debt is growing by leaps and bounds. This is breaking past all records previously held by other lines of credit. For the first time in the history of US, student debt surpassed credit card debt in 2010 and then it overtook auto loans in 2011. Finally, the Consumer Protection Bureau had to admit this March 2012 that student debt has swelled over $1 trillion mark. Therefore, students need to plan their finances to pay for their college fees since the debt relief programs provided by the government are very tough to qualify. It is imperative for them to know about the types of loans since each of them has an eligibility criterion of their own and their repayment plans too differ from one another. Government-endorsed student loans – This kind of loan was previously given out to students under the Federal Family Education Loan (FFEL) program. The government used to back the loans taken by students from private lenders. However, the government has stopped doing this since 30th June, 2010. Private loans – These loans carry a high rate of interest since the government doesn’t take responsibility for them. Loans like these do not have a fixed rate of interest that enables the lenders to hike rates later on. Direct loans – The US Department of Education doles out loans to students that are known as federal direct loans. These loans have the most affordable rates amongst them all. The repayment plan too is quite flexible than the other types of loans. Students can opt for subsidized loans for which the government will pay the interest while they are on grace period or going through the course. However, unsubsidized loans do not have these provisions for the borrowers. 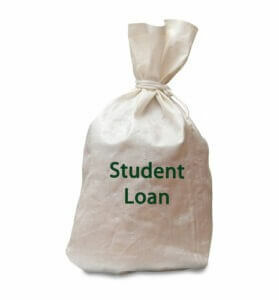 Student may opt for any type of loan depending on their financial condition, but they must also have a plan well in advance that will guide them to repay the loans as soon as possible. However, they have to learn how to get the most suitable ones for themselves before even thinking of repaying the loans. Career plan – Students must have a clear notion about their career objectives while preparing for the college. They must go through an aptitude test that will help them to decide on a career, they would easily excel on. This is because their salary will depend on the kind of career they choose. Hence, they can take out loans accordingly so that it is comfortable for them to make the payments. College plan – They need to earmark colleges for which they are going to apply. This is because educational institutions are central to the overall development of the students and so, shapes their future accordingly. Loan affordability – Students must use loan repayment calculators to derive how much monthly payment amount they can afford. Their total loan should never be more than their first annual salary. In order to help students understand better, here is an example for them. Take for instance, a life science job can provide with an annual pay of around $47,500. Out of the total income, if a student pays approximately $20,000 as overall college fees, then he/she must have a monthly salary of about $230, for the full next decade. From the net income of about $2900, out of which 8% (or $7,600 along with the interest accrued) can be used for debt payments. Hence, this loan amount will be the most apt one for students who want to make life sciences their bread and butter. Take help – Students may approach financial planners or credit counselors for help should they find it difficult to manage their financial resources efficiently. Even students who live with their parents should not loose conviction of repaying their loans the earliest. They must realize that it is their responsibility to pay off what they borrowed as per the agreement. Make timely payments – It is very important for the students to avoid defaulting on the loans. This should be done at all cost since it will have adverse effects on their finances both in the short and long term. In case students find it difficult to make the monthly payments, then they should look for deferments. They may also negotiate with the lenders to lower the rate of interest or ask them for permission to pay only the interest for a certain period of time. Moreover, students can take out a debt consolidation loan to repay more than one of the creditors. Get a job – Students should consider working part-time or as interns in order to enhance their chances of making full monthly payments and avoid defaulting on the loans. Apart from that, this will help them to create an attractive resume, build professional network, and gain valuable experience. Lastly, students should keep themselves updated with the latest trends and issues that are of global importance. This will give them an edge when facing an interview panel and clinch a well paying job. Through these initiatives students will hopefully become debt free very quickly. Andrew Jackson, financial counselor associated with Oak View Law Group, APC for over 4 years. He analyses people’s financial situation minutely and advises on different debt relief options available to people. He also helps people managing budgets to keep an eye on their financial planning.